The Murdock family lives in poverty. Ben (J. Farrell MacDonald), the patriarch, is out of work and relies on his children to pool their money and support the family. He and his wife Agnes (Clara Blandick) have high hopes that their daughters will marry men who bring home decent paychecks. Peg (Anita Page) hopes to marry Nick (Clark Gable), a hard-working fellow who brings in a steady-but-not-extravagant income. Laura (Constance Bennett), another Murdock daughter, would much rather marry for love. One day, while working at the local department store, Laura is scouted by a modeling agency and accepts the gig. She starts out at five bucks an hour, sitting in portrait sessions for illustrators. Getting in the good graces of agency head Willard Brockton (Adolphe Menjou) after he learns that she’s single, Laura soon finds her life changed. She is given more modeling jobs thanks to her “in” with Brockton, and she’s able to live in his lavish apartment in the city. Her parents’ “money over love” idea seems to be working out pretty well for her, as Brockton’s “kept woman.” But will she be willing to give it all up if she finds true love? Jack Conway directs 1931’s The Easiest Way. Adapted from a much saucier 1909 Broadway play by Eugene Walter, the script was penned by Edith Ellis. 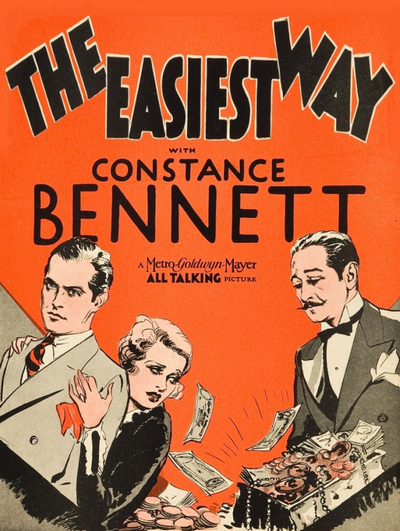 Despite the charm of Constance Bennett, The Easiest Way is very much a middle-of-the-road film. While the premise offers potential for exploration of social class issues and personal morals, the film instead plays as a pretty standard romantic drama, centered on a lackluster love triangle. Not enough time is spent building either of the “triangle” relationships for the viewer to become emotionally invested. The film is most interesting as an old Hollywood artifact, due to its background of censorship and its part in the star-making of Clark Gable. A silent film was made from Eugene Walter’s play in 1917. Between that time and 1931, when this second adaptation was finally released, several attempts were made to bring the story to the screen. Adaptations were planned but scrapped every year from 1927 through 1930. The Hays Office constantly intervened. The censors considered the original play to be “unacceptable” material and warned would-be producers that a film version would likely be banned in many locations, and as a result they would lose money. Columbia took an interest in the play, but ultimately rejected it after the censors suggested changes to the story and title, according to TCM. Finally, MGM purchased the story and put the wheels in motion for this 1931 adaptation. After the film’s release, Columbia accused the Hays Office of preventing their company from making the film, while unfairly allowing MGM to use the same story. Censorship efforts and behind-the-scenes Hollywood politics did not stop the final MGM product from succeeding in one way: it helped make Clark Gable a star. Andrea Passafiume notes that in the small role of Nick, Gable captured the attention of many a movie-goer. Women reportedly inquired about the identity of the “handsome laundryman” in theatre lobbies across the country. Gable’s star quickly rose, with MGM putting him in twelve other films in 1931 alone! So, while it isn’t a stellar watch, The Easiest Way is still a point of interest for classic Hollywood devotees. Worth watching for fans of Constance Bennett and Clark Gable, or those interested in censorship. Thanks for reading! I’m always happy to hear that my blog has introduced someone to a film they’ve never heard of! The pre-code era is full of forgotten gems to discover.